How Varying One Exercise Can Help Target Different Muscles! If you are in the gym and are looking for a new way to challenge yourself and add some excitement to your workout, try adding a variation to the classic lunge. See a variety of lunges right here! However many don&apos;t realize that by simply adding a small variation to these basic exercises you can continue to further challenge your muscles and often stimulate new ones. One of the biggest reasons that people begin to plateau in their workouts is because they are doing the same thing over and over again. Gradually the body gets used to this and sees no reason to continue to come back any stronger, as it is now fully capable at handling the stress that you are placing on it. This is why varying your workouts is crucial to your fitness success. By slightly changing common exercises however, you can bust out of this plateau and reach new heights. 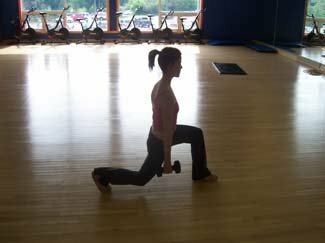 A common exercise that can be performed a variety of different way is the lunge. To complete the basic form of this exercise, hold a couple of dumbbells and stand straight up, feet about shoulder with apart. Then place one foot in front of the other and bend both knees (making sure to keep your knees above your toes) until your behind leg is bent and the knee is almost touching the floor. Go as far down as you feel comfortable and then pause for a second and raise back up into a standing position, pushing off your back foot and using your front quad to complete the action. This is your standard lunge and works primarily the quadriceps and the glute muscles. Variation 1: Small Step Forward. One variation on this is to take a smaller step forward. When performing this variation, it is particularly important to ensure that your knee is tracking straight over your toe. By performing the lunge this way, you will put more emphasis on your front quadriceps muscle and less on your hamstrings. Variation 2: Large Step Forward. The next variation on the lunge is to do the opposite and take a longer step forward. This will again change the emphasis of the muscles being worked and target the hamstrings and glutes to a much greater extent, while giving the quads more of a rest (from the standard lunge). When performing this variation, just be sure not to take too far of a step forward, as this will probably throw you off balance and you won&apos;t be able to handle enough weight this way to effectively challenge your muscles. Another variation is to take your basic lunge, and instead of stepping straight forward with your foot, step slightly to the side. This will look almost like a wide stance squat when you are performing it. When you are performing the lunge this way, you will target your glutes to a good extent as they will be used in stabilizing your weight and keeping you balanced. The quadriceps and hamstrings will also come into play as well. Again with this one, watch the knee and try and be sure it is following the toe. If you find your knees are moving too much inside of your toes, this probably means you are stepping to wide and need to adjust your stance. An individuals&apos; degree of flexibility will also determine how wide of a stance they will be able to take in this exercise and how low to the ground they will be able to go. The final variation of the lunge that you can perform is commonly known as a single-legged squat. For this exercise, put one leg up on a bench or box behind you. Then holding a pair of dumbbells or a barbell across your back (or no weight if you are just beginning) squat down by bending the front leg. Again, your stance in this exercise will determine what muscles are used. The farther away your standing leg is from the bench, the more the hamstrings will be used, and the closer it is, the more quads will be used. The glutes however, will get a great workout with either of the variations in stance on this exercise and you will likely find you are quite sore the next day after performing this (why I am advising beginners start of with no weight). So the next time you are in the gym and are looking for a new way to challenge yourself and add some excitement to your workout, try adding a variation to the classic lunge. Don&apos;t perform all the variations on the same day however, as you are still working a lot of the same muscles and this would prompt and overtraining response. By varying the exercises from workout to workout, you will be less likely to get into a plateau and more likely to keep your interest up to get to the gym on a regular basis.